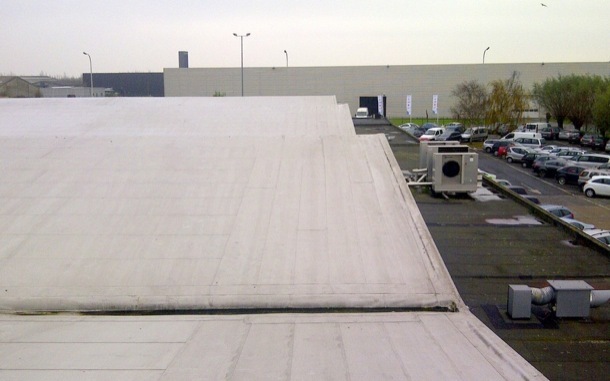 Unprotected sloped rooftops can allow fall-related worker fatalities to occur on your time clock. As a safety personnel or building maintenance manager, it is your number one priority to protect your employees from bodily harm to the best of your abilities. In fact, the law states that you are required to implement an OSHA-certified safety management program for your employees working at heights. However, many companies refuse to abide by OSHA's guidelines, and the organization lists construction fall protection as the second most frequently cited violation in 2011. Because falls contributed to 34 percent of the total deaths of construction workers in 2010, the absence of a sloped roof railing is something that your company cannot afford to do business without. Unlike other sloped roof guardrails, our KeeGuard safety rails for sloped roofs offers an advanced technological design that does not penetrate the roof's membrane. This patented system features pre-fabricated modular panels that eliminate the need for drilling, welding or threading into the roof. 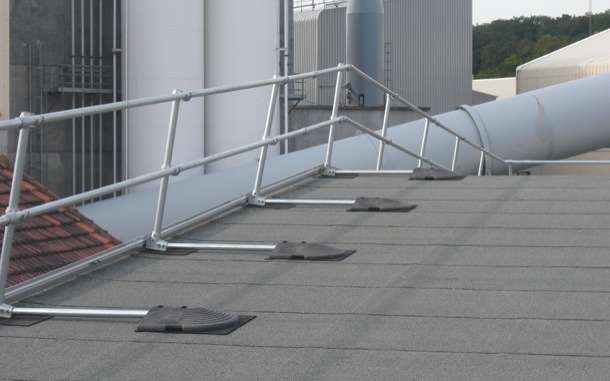 The KeeGuard fall protection system also includes special pads along the bottom of the kickboard fittings that provide an additional layer of protection against roof damaage. 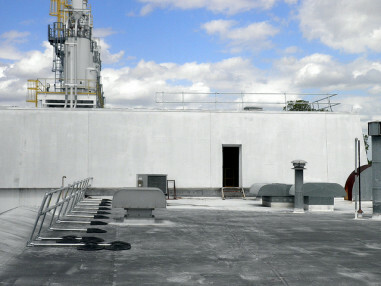 Best of all, our KeeGuard system exceeds OSHA standards for roof fall prevention. In years past, installing a sloped roof guardrail was a tedious, time-consuming endeavor. 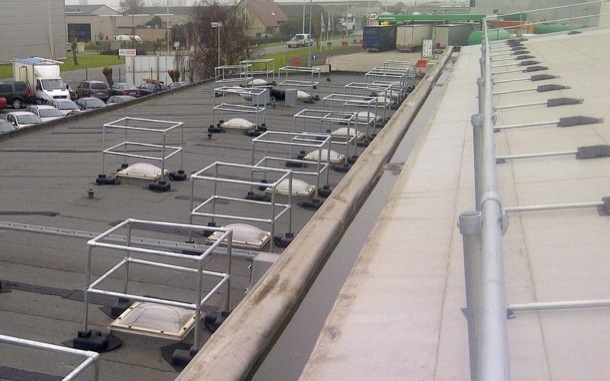 However, our KeeGuard roof fall protection system has transformed the process into a simple event that can be performed by two workers without any specialized training. In fact, the workers can install 600 linear feet of the system in one, 8-hour day. 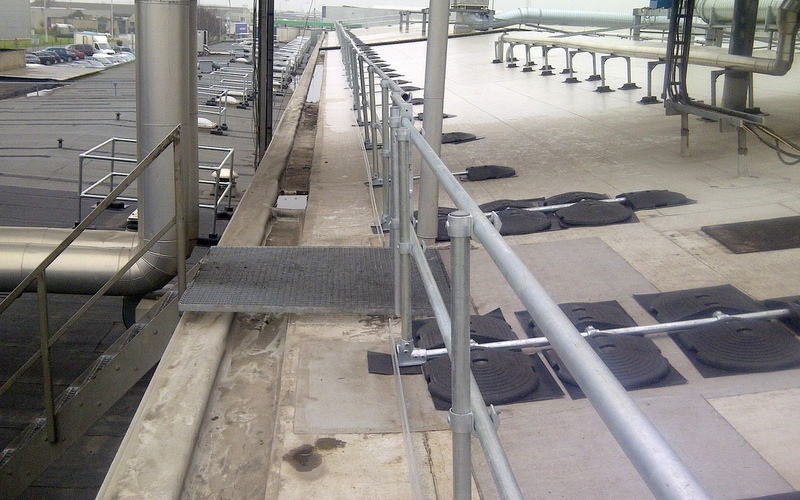 The workers simply attach the ready-made pipe railings together with an allen wrench and torque wrench to secure them into place along the edges of the roof. 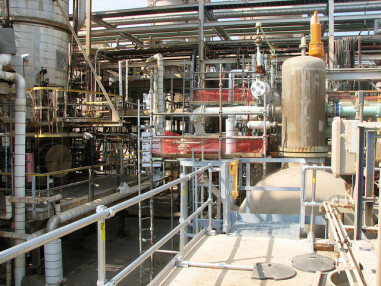 The workers then connect the pipe railings to the rubber-padded bases with the same tools to anchor the system in place for either temporary or permanent use. Our KeeGuard sloped roof guardrail system provides multi-level sloped roof protection. Notice how our system easily locks into place over the skylights along the lower level while simultaneously providing the upper deck of the roof with worker fall protection. Most worker falls happen at a sloped roof's point of entry. 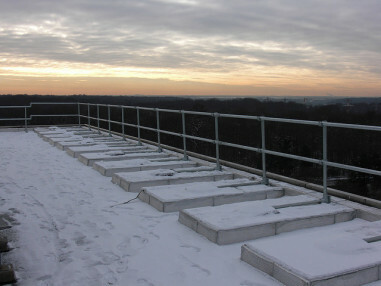 Therefore, our KeeGuard system serves as a visual guide to prepare your workers for safer access on and off of the roof. 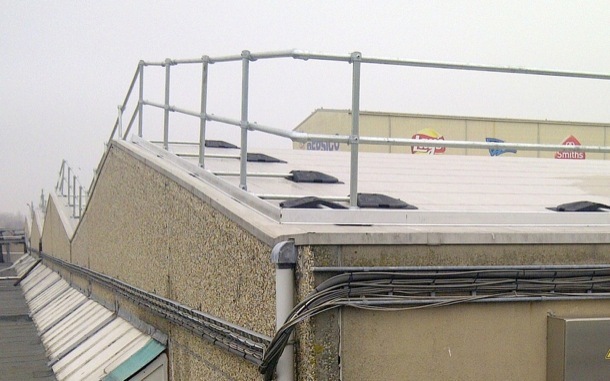 We also provide optional, self-closing safety gates to ensure that your workers are better protected from falls while working near the roof's entry and exit locations. 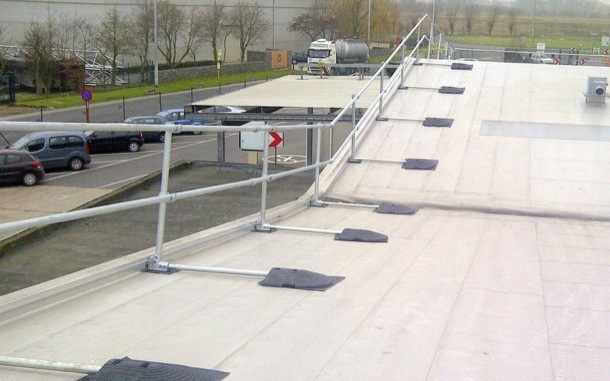 Whether you need all-encompassing or pre-designated sloped roof railings, our roof fall protection system can adapt to fulfill your immediate needs. All of the system's components can be hoisted onto your roof with a crane for installation. 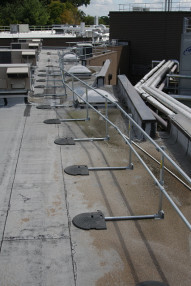 Contact us now to learn how easy it is to install a KeeGuard fall protection system to comply with OSHA standards and protect your workers from potentially fatal falls today.